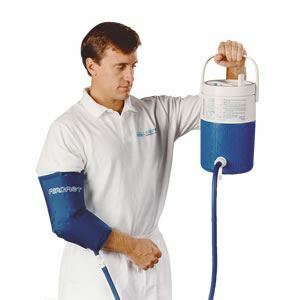 Aircast Cryo/Cuff For Elbow With Cooler (Non Motorized Kit),Used to give maximum relief for elbow from swelling, inflammation, pain and swollen joints.Best Priced Kit in Market. Aircast Elbow Cryo/Cuff is designed to give maximum relief from swelling, inflammation, pain and swollen joints. Cooling effect helps ease the pain. The design allows to cover the elbow completely for better treatment and maximum therapy by Cryo. It comes with a cooler and a cuff. Elbow Cryo/Cuff can be ordered alone or with a cooler. The cooler can also be purchased as a separate assembly and can be used with any Cryo/Cuff model. Aircast Elbow Cryo/Cuff is designed to give protection to the entire elbow area. On regular usage, it reduces the pain and swelling. Elbow Cryo/Cuff with cooler provides ice therapy to the users by giving cooling effect which reduces the pain. Most of the people use this product following elbow injuries/surgeries. Easy to apply; thus can be used at home to get rid of mild elbow strains. Cooler is universal to all the Cryo/Cuff models. Sizes available for both Pediatrics and Adults. I ordered this cryo cuff for elbow after my son got operated for his elbow injury. I not only liked the product, but the service was amazing. The prices are great and cheaper than other Canadian websites. I received this product in no time. Their website too is quite easy to navigate. I am very happy with the product and the service. check-out slightly confusing, but easy once I figured it out. Communication via email and voicemail was appreciated. Also, the item was substituted for what I was told was a better quality, but at the same price, in order to expedite the delivery. Well done! I bought this product after my elbow surgery. It worked for me, its regular usage gives relief from pain. The ice therapy helps in reducing the swelling and pain. Very comfortable, easy and simple to use. The product was exactly the same as mentioned on the site. I had an elbow surgery. After surgery,my physio used this cryo cuff for me for healing process. This device works on compression and cooling therapy. Compression helps in minimizing the swelling and cooling effect minimizes the pain. This kit did the job well. Both cuff and cooler are easy to use. Very helpful product post surgery. I am using this product for treating the elbow pain. It is far better than the one I have used earlier. It eases the pain and lessened the swelling. Moreover, this cryo cuff is very comfortable and easy to wear. I have recommended this product to my friend. She is also very satisfied with the product. Will definitely recommend to others. An economic, comfortable, easy to use and easy to handle product. It covers the entire elbow area which helps in better treatment and maximum relief. The best feature of this cryo cuff is that it works on pain and swelling both. Best treatment for elbow injury. Aircast elbow cryo cuff provides significant relief from pain and swelling related to elbow. A worth buying,helpful and supportive split for elbow issues. An integral product for post operative recovery and healing process. I have bought this product as my surgeon has recommended me to use it post my elbow surgery. I am so happy that I have listened to my doctor and tried this wonderful product. I have used it regularly and I am so relieved. There is no more pain and swelling.